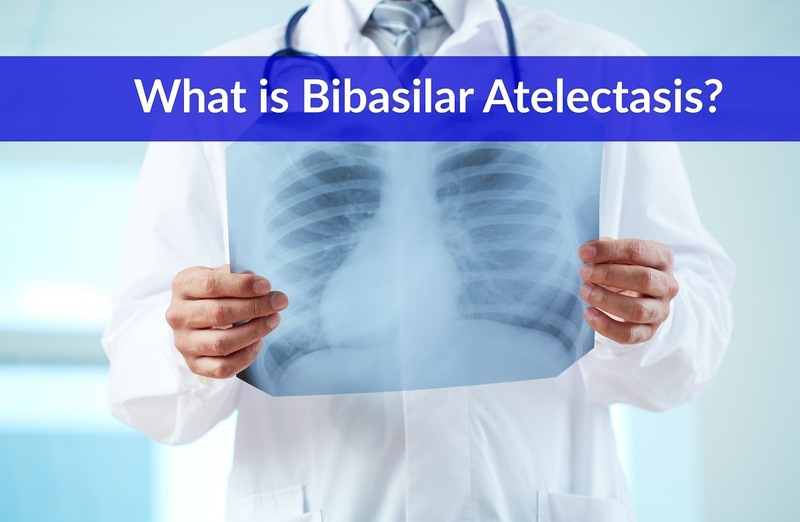 Bibasilar atelectasis is a medical term that translates to mean the partial or complete collapse of one or both lungs. It is commonly confused with pneumothorax, another condition in which the lungs can collapse, but each arises from different causes. It is important to understand how bibasilar atelectasis can occur, especially since it is closely linked to certain underlying medical conditions as well as being a fairly common complication during surgery. In this article, learn the causes, signs and symptoms, diagnostic methods, treatment and preventative approaches for bibasilar atelectasis. Bibasilar atelectasis is one type of atelectasis, or lung collapse. The lungs are filled with small sacks of air called alveoli. (2) These air sacks supervise the exchange of oxygen and carbon dioxide. The alveoli are very small, delicate and are very sensitive to any type of airway blockage. Blockages can arise for a variety of reasons, but when a blockage occurs and reduce oxygen delivery to the lungs, these tiny air sacs will deflate. When the air sacs deflate, the lung itself will deflate in the area where the alveoli are affected. When both lungs deflate in the lower area, this is called bibasilar atelectasis. Non-obstructive atelectasis is caused when an airway gets blocked for some reason. Obstructive atelectasis is caused by pressure on the lung from an outside source. The reason atelectasis is so common during surgery is because the anesthesia causes changes in both breathing and pressurization of the alveoli, which can lead to temporary partial or total collapse. » Injury to the chest area. » Fluid buildup in the lung tissues (pleura). » Air leaking out of the lungs into the chest wall (pneumothorax). » Scarring of the lung tissue (bibasilar scarring). » The presence of a tumor. » Narrowing or blockage of the airways (often caused by disease). » Tumor inside the airway(s). » Blood clot that gets trapped in the airways. » Accumulation of mucus during illness. » Ingestion of a foreign object (particularly common with children). » Compression. Compression can occur with either non-obstructive or obstructive type. When the airway becomes compressed from within or outside, it is vulnerable to collapse. » Adhesion. Adhesion refers to the absence of a critical component called surfactant. Newborns, the elderly and smokers are most at risk of developing critically low surfactant levels that can cause the collapse of the alveoli and lead to atelectasis. » Hypoventilation. Hypoventilation translates to mean “failure to take in sufficient oxygen.” This can occur during surgery or when there is sufficient pain during inhalation that the individual chooses to breathe shallowly. » Obstruction. Obstruction can occur for a variety of reasons as outlined here. There are two basic classes of bibasilar atelectasis symptoms: acute and chronic. Acute symptoms will develop quite suddenly, often becoming severe rapidly. Chronic symptoms, however, will build more slowly over time and can be much easier to miss. For this reason, it is vital to be attentive to early less severe symptoms and seek treatment before the condition worsens. » Chest pain that gets worse during coughing or deep breathing. » Bluish cast to the nails, skin and lips. » Fever (only occurs with further complications from atelectasis). 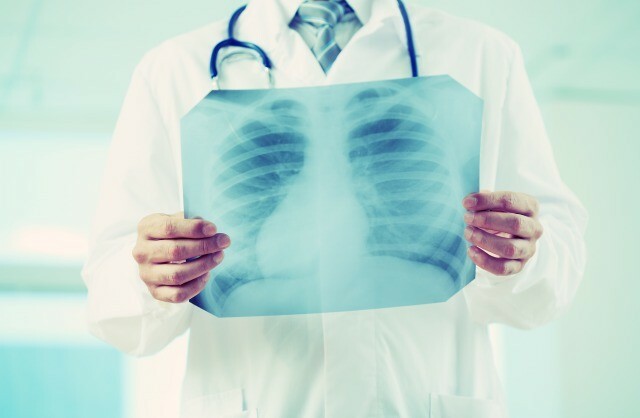 There may also be additional specific symptoms based on the presence of an underlying medical condition that is prompting atelectasis to occur. Diagnosing bibasilar atelectasis begins with a description of symptoms. This is especially important in cases of chronic bibasilar atelectasis when the symptoms can build more subtly and slowly over time. Once this health disorder is suspected, the first step is to perform a complete physical exam, paying special attention to breathing and lung function. » Absent or very quiet sounds of breathing when listening through a stethoscope. » The presence of specific percussive sounds (produced when the physician taps on the chest). If the initial physical exam confirms the possibility of bibasilar atelectasis, the next step will be to look more closely at what is going on in the chest area and in the lungs. » Chest x-ray. The chest x-ray will look for changes in the surrounding organs that indicate partial or full lung collapse. Changes that can be indicative for this condition include an enlarged diaphragm or a shift in position (towards the collapsed area) of the heart and/or trachea. » Chest CT scan. The chest CT scan is done for two purposes: to confirm findings from the chest x-ray and to look for possible obstructions (i.e. tumors, lymph nodes that are enlarged, et al). » Bronchoscopy. The bronchoscopy is performed to identify what may be causing an obstruction that is causing bibasilar atelectasis. 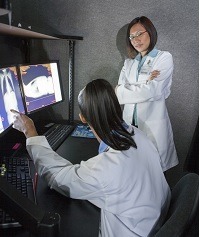 In this test, a very slim camera-equipped scope is passed through the mouth and down into the bronchial region to look for mucus, blood clots, a foreign object or other possible causes. » Oximetry (blood gas). This test is used to pinpoint the severity of oxygen deprivation due to bibasilar atelectasis. There are other more specific tests that a physician may order depending on the patient’s specific symptoms and the possible presence of another underlying medical condition (i.e. cancer, kidney disease). Treating typically focuses on the underlying reason that the patient has developed atelectasis symptoms (compression, adhesion, hypoventilation, obstruction). If the cause is acute, treatment will focus on immediate relief of symptoms. 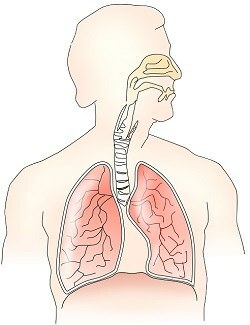 » Postural positioning to alleviate mucus build-up and allow for re-expansion of the collapsed portion of the lung(s). » Application of respiratory medications or sprays. » Use of positive expiratory pressure (PEP) devices to open up the airways again. » Initiate deep breathing exercises to re-expand the lungs. If the cause is chronic and relates to another medical condition such as cancer, pneumonia or the presence of a tumor, the goal will be to treat the underlying condition as a pathway to reducing symptoms of bibasilar atelectasis. This may involve tumor removal, chemotherapy and/or radiation, smoking cessation and other methods. If you suspect or have confirmed that you have bibasilar atelectasis, it is important to monitor your symptoms carefully. » Keep a daily journal log of your symptoms, including any breathing changes. » Take the help of PEP devices to strengthen breath and lung function. 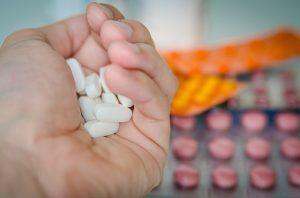 » Use prescribed medications in accordance with your physician’s instructions. » Perform daily deep breathing exercises to keep airways strong and clear. » Learn alternate positions to aid mucus flow and fluid drainage. » Proceed with diagnosis and treatment for any underlying medical condition that may cause your symptoms of bibasilar atelectasis to worsen.